A decade barren of Michelin stars means that the chattering inevitably starts up when a chef with credentials turns up in town. Martin Wishart has the accolade secured at his original Edinburgh restaurant and at Cameron House by Loch Lomondside, but his high-profile new venture at Malmaison in Glasgow is more appropriately viewed not as a venue reaching for the stars but an extension of his brasserie concept, first aired in the original Honours on North Castle Street in the capital. 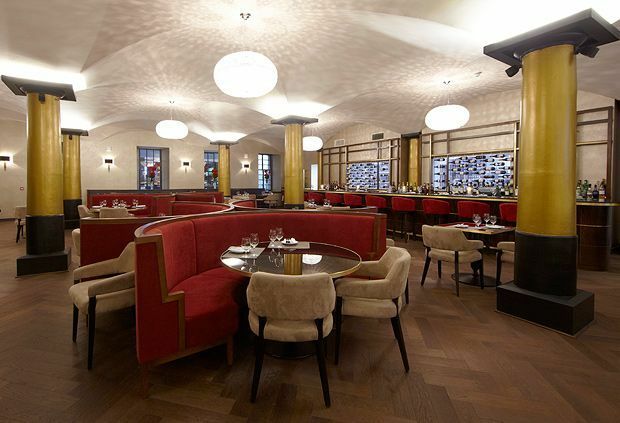 Part of a £1.2m refurbishment within Malmaison Glasgow that also incorporates a chic cocktail bar, the basement restaurant has 106 covers across an interior of understated elegance styled by Curious Design, with pitched ceilings, sturdy columns, red semi-circular booths and wooden floors. On one wall Peter Lavery's bold Glasgow and Clyde murals emphasise the local identity. This is high-end brasserie dining with prices to match – three courses could set you back north of £50, which makes a prix fixe menu at £22.50 a decent deal indeed. Former One Devonshire Gardens head chef Andrew Greenan has returned to Glasgow to lead the The Honours’ kitchen in impressive style. Innovative starters are a multi-sensory delight – from a light and foamy crab cappuccino to an indulgent tagliatelle with scallops in dense truffle purée. Star of the show is a well-considered range of steaks cooked in a Josper Grill, an enclosed charcoal-fired grill that allows chefs to cook meat at 650°F, creating cuts that are cooked quickly, remaining tender, with flavours locked in. Pride of place goes to the The Honours Chateaubriand for two, which despite its £69 tag is the biggest selling item on the menu. A rump of lamb – also cooked in the Josper – comes on a bed of puy lentils so bursting with seasoning that the meat itself takes a back seat while a range of fish and game options give the menu more depth than you’d expect to find in a high-end kitchen. Desserts are showy and compelling: pear sorbet combined with a sharp chocolate parfait is the kind of dish that stifles conversation until the plate is clean. Wishart spent two years looking for the right venue in Glasgow before striking this deal with Malmaison. The success of the venture could see the partnership extended nationwide. Glaswegians needn't be too concerned by that, however – they've secured their new year honours.